St. Louis University is well know for its soccer program, which has won 10 national championships! 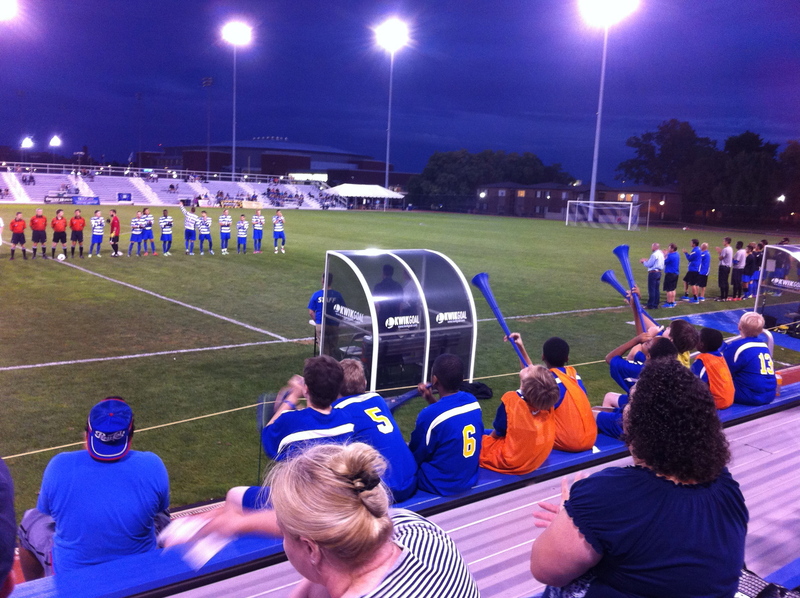 Because SLU does not have a football team, the soccer team has been their biggest sport (although basketball may have overtaken it recently due to their success). In fact, SLU’s homecoming is at a soccer game. I went to a Wednesday night game against #4 Creighton. SLU was ranked #22. The soccer stadium is located right next to the student center and was well attended by both students and outsiders, especially for a Wednesday night-the total attendance was over 3,000 people. Tickets were purchased on the spot and cost $10. Additionally, SLU was giving out free vuvuzelas as a promotion. While, free vuvuzelas seemed like a good idea, it turned out to be horrible as lots of little children played the vuvuzelas the whole game, which was pretty annoying. The game itself was very well played, as both teams are very strong. SLU ended up winning 1-0 with a goal scored in the 70th minute! St. Louis is surprisingly one of the biggest soccer cities in America and it is really cool to see that in person.